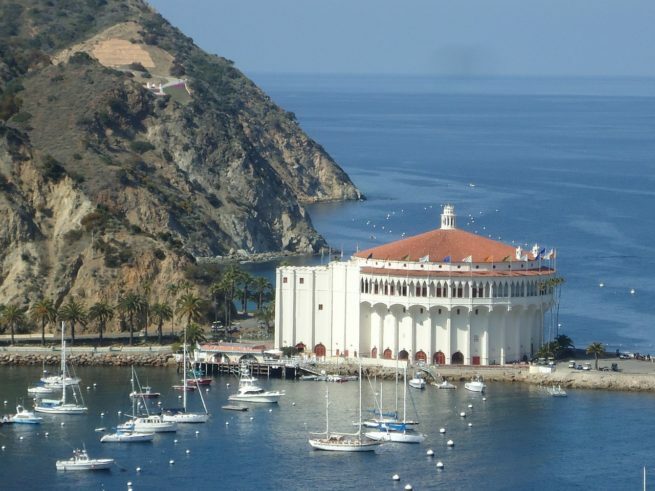 Fly private to Catalina Island, a popular weekend-getaway off of the coast of Los Angeles. The island is home to some of the best scuba diving around, and whether you’re flying private into (AVX) Catalina Airport or would prefer to arrive on the island in a private charter helicopter, we can help arrange the right aircraft and flight itinerary that best suit your needs. Los Angeles Private Jets believes in providing private flyers with a one-on-one consultative service experience that exceeds every expectation. We understand that your time, privacy, flight preferences and most of all, safety, are all extremely important. Our Catalina Island Jet Charter representatives are available for you by phone and email 24 hours a day, 7 days a week. When using our private aviation service, you can expect quick response times and an easy, hassle-free booking process. Request a quote or call us to arrange your private flight to Catalina Island, California. Catalina Island lies about 22 miles southwest of Los Angeles, and is known for its varied wildlife, some of the world’s best scuba diving sites, and Cabana-lined Descanso Beach. Fly private into (AVX) Catalina Airport, and enjoy a Mediterranean-style vacation at one of the resorts of Avalon without having to clear customs, or pay for international airfare. The Catalina Canyon Resort & Spa is a full-service resort with a comfortable, relaxing ambiance, and the breath-taking views of the surrounding harbor and understated elegance of The Avalon Hotel make it the island’s premier boutique accommodation. Villas are also available for rent, whether you’d prefer an ocean-front villa along Hamilton Cove or a quaint cottage in Avalon. Plan to visit at your leisure – the forecast here is dry and mild year-round, however, be advised it’s a popular weekend destination for many Angelenos. Whether you’re chartering a private flight for a luxury getaway, a wedding, honeymoon or other special events, make sure to check out our list of top choices, based on Los Angeles Private Jets passenger feedback, location, amenities and reviews. Once you arrive on Catalina Island via luxury private jet, our representatives can also arrange ground transportation to/from the hotel of your choice. Catalina Island, a resort destination located 22 miles off the coast of Los Angeles, is a premier destination for private flights and helicopter charters. The island features a variety of wildlife, and the Catalina Conservancy, which owns nearly 90% of the island, was chartered to protect the island unique ecosystem. The island was formerly owned by chewing-gum magnate William Wrigley Jr., who purchased the island in 1919 and made it the spring training home for the Chicago Cubs. Commercial endeavors and tourism are mostly concentrated in Avalon, a resort community adorned with boutique resorts, posh retail shops and adventurous restaurants. The Avalon Theater at the Catalina Casino is also in the city, a landmark attraction that features a ballroom, movie theater, and the Catalina Island Museum – no gambling takes place here, instead using the Italian meaning of the word defined as “social gather place”. While Avalon is the islands only true city, the rustic seaside village of Two Harbors can be found at the island’s isthmus, and is a popular starting point for many snorkeling and scuba diving operations. The city of Avalon is small enough to be explored in an hour or so, leaving plenty of time for outdoors adventures, many of which can be found at Descanso Beach Club. Enjoy exploring the island by zip-lining, hiking or mountain biking with several rentals available throughout. 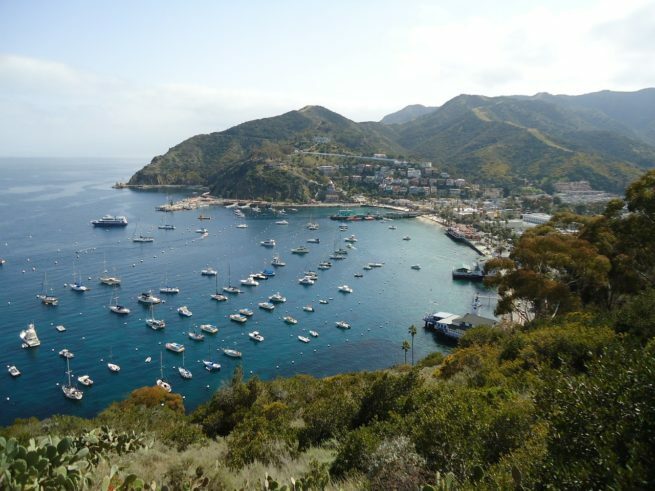 Many diving enthusiasts flock to Catalina year after year, a haven for some of the best diving in the world. Catalina works hard to keep it that way, making sites such as Casino Point protected dive sites, meaning nothing can be removed to maintain their pristine condition. Those interested in watersports can choose from ocean kayaking on crystal clear water, or snorkeling, scuba diving and underwater walking tours off the coast, with marine sanctuaries full of sea life including rays, octopus, lobsters and horn sharks. Glass-bottom boat tours are available for those who want a glimpse of Catalina’s rich sea-life, but prefer to stay dry. Seaside camping, pleasure boating and just plain relaxing on sandy beaches are always en vogue. If you’d like to charter a private yacht for leisure or sports fishing during your stay, our jet charter representatives are available to assist you. Check out more of our recommendations for things to do after your private flight to Catalina Island, California. This seaside village gets its name from being the location of Isthmus Cove and Catalina Harbor, a mere half-mile wide stretch separating the bodies of water 20 miles north of Avalon. The area offers kayaking, biking, camping, boating and plenty of relaxation to spare. Many visitors sail over to Two Harbors in private boats, mooring up at one of over 700 available moorings. Los Angeles Private Jets utilizes the following airport to fly clients privately to/from Catalina Island, California and neighboring areas. Request a Quote or give us a call at 1-888-987-5387 to speak with one of our Catalina Island Private Jet Charter agents for your next luxury vacation, business trip, or special event.